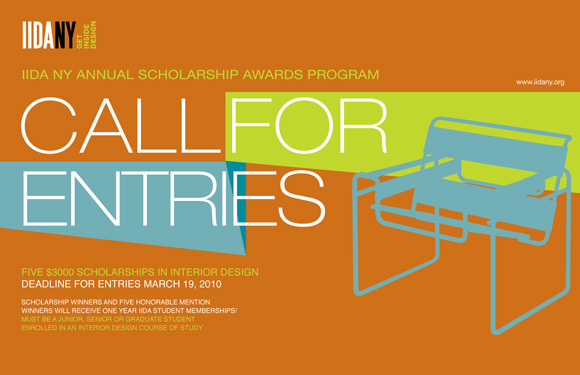 The International Interior Design Association’s New York chapter (IIDA NY) is now calling for entries for scholarships in interior design. Five winners will receive a $3000 scholarship and a year-long membership to IIDA NY; five honorable mentions will also be awarded membership. A professional networking and educational association, the IIDA NY has more than 600 members in ten specialty Forums. Benefits of membership include resources to access experts, knowledge and information about interior design, and contacts within the industry. Networking is encouraged, and events promote bonds of trust, collaboration, and innovation. Founded in 1994, the association’s mission is to represent interior designers worldwide, while encouraging advancement and education within the industry. The contest is open to junior, senior, and graduate students who are enrolled in an accredited New York State Interior Design program only. Students will be judged on the quality of their portfolio, and their stated philosophy of design. March 19, 2010 is the official deadline, and consideration will only be given to the first 75 applicants, so get your submission in soon!